The amazing Nadia Matar of Women in Green (you're clicking on her ad and sending a well deserved donations I hope), drove out of her village of Efrat this morning and was surprised to see just 20 meters from the road the scene below. Hamas Hizbollah and PLO flags flying next to the entrance to Efrat, right on the Route 60 highway. 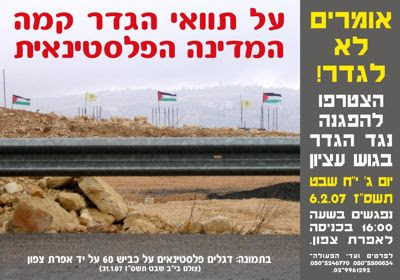 Anyway, on Tuesday Feb 6, there will be a protest against the useless fence. In fact you can see from the photo below how useless it is. This is how the Arabs regularly enter Northern Jerusalem, supposedly made safe by the fence. Stop the Madness - Fight Arab terror properly. Not my post, but it should have been. Caroline really tells it like it is. In the world of international diplomacy few issues receive more wall-to-wall support than the notion that it is essential to establish a Palestinian state. Leaders worldwide are so busy speaking of how essential it is for a State of Palestine to be founded that none of them seems to have noticed that it already exists. This state was officially founded in the summer of 2005, when Israel removed its military forces and civilian population from the Gaza Strip and so established the first wholly independent Palestinian state in history. Israel's destruction of four Israeli communities in Northern Samaria and curtailment of its military operations in the area set the conditions for statehood in that area as well. And so it is that as statesmen and activists worldwide loudly proclaim their commitment to establishing the sovereign State of Palestine, they miss the fact that Palestine exists. And it is a nightmare. In the State of Palestine 88 percent of the public feels insecure. Perhaps the other 12 percent are members of the multitude of regular and irregular militias. For in the State of Palestine the ratio of police/militiamen/men-under-arms to civilians is higher than in any other country on earth. In the State of Palestine, two-year-olds are killed and no one cares. Children are woken up in the middle of the night and murdered in front of their parents. Worshipers in mosques are gunned down by terrorists who attend competing mosques. And no one cares. No international human rights groups publish reports calling for an end to the slaughter. No UN body condemns anyone or sends a fact-finding mission to investigate the murders. In the State of Palestine, women are stripped naked and forced to march in the streets to humiliate their husbands. Ambulances are stopped on the way to hospitals and wounded are shot in cold blood. Terrorists enter operating rooms in hospitals and unplug patients from life-support machines. In the State of Palestine, people are kidnapped from their homes in broad daylight and in front of the television cameras. This is the case because the kidnappers themselves are cameramen. Indeed, their commanders often run television stations. And because terror commanders run television stations in the State of Palestine, it should not be surprising that they bomb the competition's television stations. SO IT WAS that last week, terrorists from this group or that group bombed Al Arabiya television station in Gaza. And so it is that Hamas attacks Fatah radio announcers and closes down their radio station claiming that they use their microphones to incite murder. Because indeed, they are inciting murder. What would one expect for terrorists to do when placed in charge of a radio station? And so it is that in the State of Palestine, journalists - whether members of terror groups or not - are part of the 88 percent of their public who are afraid. Sunday they protested outside the offices of one terror faction or another that controls the Palestinian Authority. Speaking to The Jerusalem Post, reporter Ala Masharawi explained, "No one goes outside, no one moves without thinking twice. Gaza's streets have become terrible streets, especially at night. Gaza is a ghost town." As the Post's Khaled Abu Toameh reported last week, in the State of Palestine, Christians are persecuted, robbed and beaten in what can only be viewed as a systematic campaign to end the Christian presence in places like Bethlehem. As Samir Qumsiyeh, owner of the Beit Sahur-based private Al-Mahd (Nativity) TV station lamented, "I believe that 15 years from now there will be no Christians left in Bethlehem. Then you will need a torch to find a Christian here." MANY GOVERNMENT ministers and commentators seek strategic meaning in the strife in the State of Palestine. Foreign Minister Tzipi Livni, for instance, goes on and on about the need to strengthen the "moderates" - that is, the Fatah terror group - over the "extremists" - that is, the Hamas terror group. Helping her to propound this nonsense is PA Chairman and Fatah chief Mahmoud Abbas. Abbas and his men tell Westerners how pro-Western they are at the same time as they name streets and schools financed by US aid after Saddam Hussein and build sports facilities on the American taxpayers' tab in memory of terrorists who killed American soldiers in Iraq. For the umpteenth time, on Sunday Fatah spokesmen in PA Chairman Mahmoud Abbas's office blamed Iran and Syria for the escalating violence in Gaza and Judea and Samaria that has killed 29 people, including two children, in four days. "Iran and Syria are encouraging Hamas to continue fighting against Fatah," they alleged. And yet, just last Thursday the Shin Bet arrested Omar Damra, a Fatah terrorist in Nablus. Damra is accused of manufacturing suicide bomb belts and attempting to smuggle them into Israel. He also stands accused of plotting to place explosive devices along roads in Judea and Samaria with the intention of blowing up IDF patrols. Damra and his partner and fellow Fatah terrorist Mahmad Ramaha, who was arrested a month ago, were working under the instruction of Hizbullah - that is, under the direction of Iran. According to the Shin Bet, Hizbullah - that is, Iran - has taken over Fatah operations in Nablus. Since Israel's withdrawal from northern Samaria in August 2005, the Shin Bet has noted that, like Gaza, the Nablus area has become a mini-Afghanistan. So not only are Hamas terrorists operating under Iranian and Syrian direction today, Fatah terrorists are as well. Yet this doesn't stop the US and Israel from pouring guns and money into the hands of Fatah terror chiefs. They fail to recognize that what you see is what you get. These guns are not used to encourage moderation. These guns are used against Israelis and Palestinians alike in a turf battle between terror groups over money, guns and power that will never end. And it will never end because fighting and killing for money, guns and power is what terrorists do. FOR THE past 13 years, since the Palestinian Authority was established in 1994, the contours of the State of Palestine have taken form in front of our eyes. Starting with Yasser Arafat's abrogation of the rule of law and murderous campaign against land dealers and journalists, with each passing year and with each move to further empower the PA, the situation has only grown worse. And yet, international pressure on Israel from Arabs, Europeans and the US to surrender more territory, curtail its authority, abrogate its claims to the areas set for Palestine, and finance the Fatah terror group have only grown in intensity. And with each passing year, as the reality of Palestine has become clearer, the Israeli leadership's will to resist this pressure is increasingly eroded. So it is that last week Defense Minister Amir Peretz announced that he supports negotiating with Hamas. Peretz laid out his "vision" for the reinstatement of the so-called peace process with the Palestinians, and stated that, to "empower" the Palestinians, he supports extending the ban on IDF operations from Gaza to Judea and Samaria. It should go without saying that such IDF operations are aimed at preventing massacres of Israeli civilians like the one that happened in Eilat Monday morning. LIVNI, FOR her part, has become the international champion of Fatah. Gushing to an audience of international peace processors in Davos, Switzerland, last week, Livni said, "In order to achieve peace and in order to promote a process, we must stick to this vision of a two-state solution and examine what the best steps to take are." Of course, neither Livni nor Peretz, who insist that Israel's most urgent priority is to establish Palestine, is willing to recognize that Palestine exists already. They refuse to acknowledge what we already know: Palestine is a terror state and an economic basket case fully funded by the international community. Indeed, over the past year since Hamas won the Palestinian elections, international assistance to the Palestinians has increased dramatically. As Ibrahim Gambari, the UN under-secretary-general for political affairs, noted last Thursday, official Western aid to the Palestinians, not including Arab and Iranian support for Hamas and Fatah, increased by 10 percent in 2006 over 2005, and stood at $1.2 billion. The Palestinians, who receive more aid per capita than any people on earth, are needy not because they lack funds. They are poor because they prefer poverty, violence and war to prosperity, peace and moderation. So it is that 57 percent of Palestinians support terror attacks against Israel. The multitude of protesters worldwide who demand an end to the so-called "occupation" and the establishment of Palestine should be made aware of the fact that Palestine already exists. The hordes of political leaders mindlessly squawking about "visions" and "two-state solutions" should know: This is Palestine. Enter at your own risk. While Eilat is on people's minds today, and Jameel is reporting that the government is planning to (temporarily?) 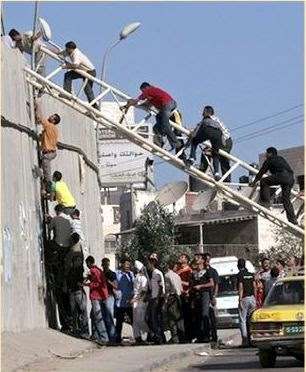 evacuate the Jewish towns around Gaza as things get worse (gee, there's the solution), I realized that people probably don't quite comprehend the extent of what is going on down south. After all, a Kassam fell the other day, big deal, just another one. I must admit, sometimes even I don't quite comprehend how bad things are. I came across the photo below (that was apparently originally from Maariv) on a French blog (don't ask). The picture is from just over 2 years ago. Looking at it you only begin to realize what the Arabs are doing to Israel and how much a failure Olmert, Sharon, Livni and the rest of the Left are, and how much damage they did and are doing to Israel. It really puts things in perspective. I listened to the President this evening. The first time he’s really spoken out about what is going on with him. The problem with listening to him (aside from a few points) was that he simply made sense. Nothing he said about the police, the media, or how either of them works was extraordinary. We all know of stories of similar tactics, methods, and goals by each organization and its members. Every word he said was quite believable, simply because we’ve heard it before and found it out to be true. So where does it leave things? I don’t know. He raised some serious questions about witnesses, histories, and facts in the case that weren’t mentioned before in the news. Is he telling the truth, or is he lying? Who knows, but those questions, points, and issues he’s raised certainly now need to be discussed and dealt with publicly and openly. And I’m not just talking about what he did or didn’t do, but also how the police and media are running this investigation/witch hunt (whichever it turns out to be). We, the public, have certainly lost faith in those organizations for oh so many reasons. If he is innocent, and as he implied, certain political figures are behind this, then something is more seriously wrong in Denmark than we previously imagined. And if he’s guilty? Well, then he is one smooth psychopath for sure. I honestly don't know which way would be worse for the State of Israel. His speech can be read here. The JPost has an article today about an internal dispute in a radical leftist organization. You see the North American Branch of Radical Leftwing rabbis decided to honor two members of another radical leftist organization who have been pursuing some IDF generals with class action suits for defending Israel. For some reason unknown to me, the radical leftwing rabbis in Israel feel it is inappropriate to honor those two radical leftists. One radical Leftist rabbi (from Israel I believe) said that Israel has a “mixed record on prosecuting human rights violations” (referring to Israel’s lack of prosecution of its soldiers for supposed war crimes?) so I guess he thinks it might be OK.
Another radical Leftist rabbi in Israel sounded very Sharon like when he said, “The very fact that we live here has an impact on how we see things”, a rather radical statement for a radical leftist. I find the whole thing especially funny as the JP ran an editorial the other day by someone who went on an outing with these radical Leftwing rabbis. What was funny was not how he reported as fact all the bubba-meisers the Arabs told him about the damage we Settlers do to the Arabs despite the videos he could have seen on JoeSettler showing the Arabs doing the damage themselves. But hey, we expect that kind of gullibility from radical Leftists as they want to fool themselves. What was amusing was despite the actual lack of seeing any settler incitement, he reports he saw Palestinian incitement and hate which left a bitter taste in his mouth. Yet despite that bitter taste, he’d still do it again. That’s ideology for you. They call for his death to his face, but hey, he’ll help them anyway. Idiot. They're laughing at him too. But if you really want to read a Left-on-Left article – this is it. And Jameel's analysis of the article here. Lots of stuff happening in Israel, but I don't feel like writing about it. It looks like Katzav is going to be forced to step down (at a minimum) - Yawn. The Yesha Council discusses the outright lies in the Peace Now report - Yawn, we all know that already. More Kassams fell near the Ashkelon Electric Facility - Yawn, nothing new there either. Gabi Gazit cut off (on the radio) Yahalom's address at the Herziliya conference because he found it boring. Gabi Gazit is boring, so who cares. This actually is interesting (to me at least). Lots of controversy surrounding Intel's possible decision to cut and run with our tax dollars after closing their Jerusalem Fab. Nope, not interested in writing about that. Arabs stone Jewish owned cars again. Nothing new there. Nope nothing at all to write about today. I’m trying to decide if Jameel is more like Ed McMahon or just one of those spam letters you get in your inbox informing you that you just won $10,000,000 (– now please supply us your credit card so we can start the payment process). I got an excited phone call tonight from Jameel that I just won first place in some blog contest. Until his phone call I wasn’t actually aware I was a contestant in a blog contest, much less that I won. Go know. Anyway, I’ll have to wait till tomorrow so he can tell me what it is he is talking about (and then I can tell you all). I just hope I don’t need to hand over my credit card number so they can confirm my prize. Based on the tail-end of a video of a fight between two neighbors in Hebron (one of them, the Jew mind you, has had her house shot at with bullets numerous times by her Arab neighbors), Tommy Lapid tries his best to malign the Hebron community by overtly implying that they are Nazis and Pogromists. Unfortunately, poor Tommy must have gotten hit in the head back in Hungary, as he really doesn’t know how to properly compare events to the Holocaust. For instance, is a fight between two neighbors, where both are spitting and cursing each other similar to the Holocaust, or is it more similar to the Holocaust when the Arabs burned down a shul this week along with the holy books inside and damaging the Sifrei Torah? Or perhaps that a fire bomb was thrown by Arabs into the Jewish Community Square in Hebron? Does that bring back any memories for you Tommy? Maybe the various stoning (by Arabs of course) of Jewish cars this week. Anything? Anything at all? Unfortunately, Tommy wants to be a perfect European Gentleman. To him that means acting like a perfect European anti-Semite. And he has that act down pat. See Cosmic-X for his take too. Payback comes in many forms. Sometimes the source is obvious, sometimes not. The JP has an article about a group of Harvard Law students using modern methods (Nexus/Lexus) to catch Nazis. They’d also find useful the email and IP address of some of the spam comments I receive. The point is that in this day and age, except for dying before you get caught, you can’t really hide your evil actions and avoid retribution. (I’ll discuss this again before Purim when we discuss one of the major hidden Nissim that occurred). In Israel it is taking a slightly different form, but the rule applies here too. Basi found out that his neighbors not approving his part in the expulsion evil was too much to bear and found himself pushed out of his home (and I’m sure not for the last time). Sharon got his in the head, but would have eventually been indicted for any number of things. At least one of his kids will eventually go to jail for his crimes. Halutz proved his failure as a military commander when it came to defending Jewish homes and finally bowed out. Olmert is under major investigations for inappropriate financial behavior, and will hopefully find himself out (hopefully we won’t get temporarily stuck with Livni). The non-Jewish behavior that the government and its supporters displayed during the disengagement is symptomatic of an entire attitude that permeates their personal lives in general. (The rest of the list includes: Ramon, Katzav, HaNegbi, Hirshenson, Ruchama Avraham, Aharon Barak (and his 16 luxury homes on a civil servants salary) – and more). The Expulsion was symptomatic of the principles that guide their lives – concern only with their personal financial and political power and callous indifference to the people and values of the Jewish State. You can call it divine retribution, but perhaps it’s merely the logical progression of events. Someone with no Jewish values and is willing or happy to throws Jews out of their homes is likely to be involved in other behaviors that are just as questionable. And so as we saw yet again today, their personal values will be their downfall. In response to an article by Jameel. Fundamentally, the Reuters article was truly unfair. As Jameel pointed out there was only one Jewish comment to the Arab’s five. Considering that we normally trade 1000 Arab terrorists for 1 Jewish soul, the Reuters article severely undervalued the Jewish opinion. Shai Dromi, the owner of Shai Farms in the northern Negev, was arrested for killing Khaled al-Atrash, 31, who police said had recently been released from prison after serving four years for agricultural theft. Al-Atrash had allegedly trespassed on Dromi's farm with three other Negev Beduin men. According to the owner, the men arrived at the farm, poisoned a guard dog [JS: named Charlie, I suspect] and broke a lock on one of Dromi's sheep pens. Dromi told detectives that a similar incident had occurred a month earlier. So alas, while the Reuters crew wasted their time talking with Arab dog thieves (I guess they couldn’t find any Jewish ones despite searching high and low), they in most likelihood, as their sole Jewish interviewee accurately explained, were probably wasting their time from the get go. What is wrong with Efrat! Every 10 feet is a speed bump, and not just a speed bump, a speed mountain. Each one higher than the one before it. If that wasn’t enough to make me nauseous and ruin the shocks on my 4x4, then we have your traffic circles. OK, Israelis love traffic circles (and many Yishuvim have them), but Efrat is probably 50% Olim, so what is the obsession? Why so many? And not just traffic circles, but extreme ones. I drove around one traffic circle that is near these new buildings that will house some 50 new settler families (excellent), but the traffic circle pushes you so close to the edge of the road – which it turns out, is a cliff. Between the nausea from the speed bumps and the extreme traffic circles, the cliff to my right was just really way to close for comfort. And when I got to your shopping center, some cop is standing in front not letting me stop there to drop everyone off. And the Fence! Why aren’t you out protesting it every day? It literally is 15 feet from your some of your homes (and it cuts through land owned by your Yishuv, and other privately owned Jewish land that goes back nearly a hundred years)!!!! In the Shomron, the residents are far more active and they often get results, such as freezes and rezoning of the Fence, and cancellation (or modification) of idiotic policies regarding the Machsom. With the exception of Nadia Matar (and did you click on her Women in Green ad that is running on my blog?) and a few others by you, I know you guys tend to be a bit laid back when it comes to protesting, but please, your moetza is really ruining what should have been a pleasant experience driving through your village (and your Mister Zol, isn't very Zol either). As the Palestinian Authority and Hizbollah holds our soldiers captive without offering any signs of life, much less visits by the Red Cross, and Israeli civilians are purposely and directly targeted by the military wings of the Palestinian Authority (does anyone know that a bomb went off yesterday in the Shomron but T"G no one was injured) certain self-serving organizations use our defense as an excuse to attack us in a way that can only be described as institutionalized anti-Semitism. I think it is important and timely to reprint this article by Alan Dershowitz that appeared in the Jersualem Post. The two principal "human rights" organizations are in a race to the bottom to see which group can demonize Israel with the most absurd legal arguments and most blatant factual mis-statements. Until last week, Human Rights Watch enjoyed a prodigious lead, having "found" - contrary to what every newspaper in the world had reported and what everyone saw with their own eyes on television - "no cases in which Hizbullah deliberately used civilians as shields to protect them from retaliatory IDF attack." Those of us familiar with Amnesty International's nefarious anti-Israel agenda and notoriously "suggestible" investigative methodology wondered how it could possibly match such a breathtaking lie. But we didn't have to wait long for AI to announce that Israel was guilty of a slew of war crimes for "widespread attacks against public civilian infrastructure, including power plants, bridges, main roads, seaports, and Beirut's international airport." There are two problems with the Amnesty report and conclusion. First, Amnesty is wrong about the law. Israel committed no war crimes by attacking parts of the civilian infrastructure in Lebanon. In fact, through restraint, Israel was able to minimize the number of civilian casualties in Lebanon, despite Hizbullah's best efforts to embed itself in population centers and to use civilians as human shields. The total number of innocent Muslim civilians killed by Israeli weapons during a month of ferocious defensive warfare was a fraction of the number of innocent Muslims killed by other Muslims during that same period in Iraq, Sudan, Afghanistan, Algeria, and other areas of Muslim-on-Muslim civil strife. Yet the deaths caused by Muslims received a fraction of the attention devoted to alleged Israeli "crimes." This lack of concern for Muslims by other Muslims - and the lack of focus by so-called human rights organizations on these deaths - is bigotry, pure and simple. AMNESTY'S EVIDENCE that Israel's attacks on infrastructure constitute war crimes comes from its own idiosyncratic interpretation of the already-vague word "disproportionate." Unfortunately for Amnesty, no other country in any sort of armed conflict has ever adopted such a narrow definition of the term. Indeed, among the very first military objectives of most modern wars is precisely what Israel did: to disable portions of the opponent's electrical grid and communication network, to destroy bridges and roads, and to do whatever else is necessary to interfere with those parts of the civilian infrastructure that supports the military capability of the enemy. That's how the American and Britain militaries fought World War II. (In fact, Israel shows far more restraint than Britain did during World War II. Prime Minister Winston Churchill directed the Royal Air Force to bomb the center of towns with the express purpose of killing as many civilians as possible.) Had the Allies been required to fight World War II under the rules of engagement selectively applied to Amnesty International to Israel, our "greatest generation" might have lost that war. The strategy of destroying some infrastructure was particular imperative against Hizbullah. Israel first had to ensure that its kidnapped soldiers would not be smuggled out of the country (as other soldiers had been and were never returned), then it had to prevent Hizbullah from being re-armed, especially given that Hizbullah damaged a ship using advanced radar technology provided by the Lebanese army and rockets provided by Iran. Hizbullah was being armed by Syria and Iran - as those countries themselves admitted - and the president, government, and population of Lebanon overwhelmingly supported the militia's indiscriminate rocket attacks against Israeli civilian population centers. The Lebanese army actively supported Hizbullah's military actions. Israel was, in a very real sense, at war with Lebanon itself, and not simply with a renegade faction of militants. The idea that a country at war can't attack the enemy's resupply routes (at least until it has direct evidence that there is a particular military shipment arriving) has nothing to do with human rights or war crimes, and a lot to do with a pacifist attitude that seeks to make war, regardless of the justification for it or the restraint in prosecuting it [at least if it's a Western country doing it], an international "crime." In other words, if attacking the civilian infrastructure is a war crime, then modern warfare is entirely impermissible, and terrorists have a free hand in attacking democracies and hiding from retaliation among civilians. Terrorists become de facto immune from any consequences for their atrocities. THE MORE troubling aspect of Amnesty's report is their inattention to Hizbullah. If Israel is guilty of war crimes for targeting civilian infrastructure, imagine how much greater is Hizbullah's moral responsibility for targeting civilians! But Amnesty shows little interest in condemning the terrorist organization that started the conflict, indiscriminately killed both Israeli civilians (directly) and Lebanese civilians (by using them as human shields), and has announced its intention to kill Jews worldwide (already having started by blowing up the Jewish Community Center in Argentina.) Apparently Amnesty has no qualms about Hizbullah six-year war of attrition against Israel following Israel's complete withdrawal from Southern Lebanon. 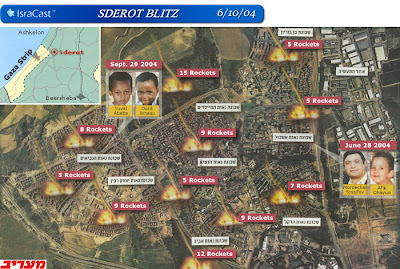 During the four week war Hizbullah fired 3,900 rockets at Israeli towns and cities with the aim of inflicting maximum civilian casualties. The Israeli government says that 44 Israeli civilians were killed in the bombardments and 1,400 wounded. AI has not issued a report accusing Hizbullah of war crimes. Israeli government spokespeople have insisted that they were targeting Hizbullah positions and support facilities, and that damage to civilian infrastructure was incidental or resulted from Hizbullah using the civilian population as a "human shield". However, the pattern and scope of the attacks, as well as the number of civilian casualties and the amount of damage sustained, makes the justification ring hollow. But the issue of human shields and infrastructure are different. The first relates to civilian casualties; the second concerns property damage. Of course Israel intentionally targeted bridges and roads. It would have been militarily negligent not to have done so under the circumstances. But it did not target innocent civilians. It would have given them no military benefit to do so. The allegations become even more tenuous, as when Amnesty writes, "a road that can be used for military transport is still primarily civilian in nature." By this reasoning, terrorists could commandeer any structure or road initially constructed for civilian use, and Israel could not touch those bridges or buildings because they were once, and still could be, used by civilians. This is not, and should not be, the law. Consider another example: "While the use of civilians to shield a combatant from attack is a war crime, under international humanitarian law such use does not release the opposing party from its obligations towards the protection of the civilian population." Well that's certainly nice sounding. But what does it mean? What would Amnesty suggest a country do in the face of daily rocket attacks launched from civilian populations? Nothing, apparently. The clear implication of Amnesty's arguments is that the only way Israel could have avoided committing "war crimes" would have been if it had taken only such military action that carried with it no risk to civilian shields - that is, to do absolutely nothing. For Amnesty, "Israeli war crimes" are synonymous with "any military action whatsoever." Amnesty International's conclusions are not based on sound legal arguments. They're certainly not based on compelling moral arguments. They're simply anti-Israel arguments. Amnesty reached a predetermined conclusion - that Israel committed war crimes - and it is marshalling whatever sound-bites it could to support that conclusion. Amnesty International is not only sacrificing its own credibility when it misstates the law and omits relevant facts in its obsession over Israel. It also harms progressive causes that AI should be championing. Just last year, for example, Amnesty blamed Palestinian rapes and "honor killings" on - you guessed it - the Israeli occupation. When I pointed out that there was absolutely no statistical evidence to show that domestic violence increased during the occupation, and that Amnesty's report relied exclusively on the conclusory and anecdotal reports of Palestinian NGOs, Amnesty stubbornly repeated that "Israel is implicated in this violence by Palestinian men against Palestinian women." This episode only underscored AI's predisposition to blame everything on Israel. Even when presented with an ideal opportunity to promote gender equality and feminism in the Arab world, it preferred to take wholly unrelated and absurd shots at Israel. Amnesty International just can't seem to help itself when it comes to blaming Israel for the evils of the world, but rational observers must not credit the pre-determined conclusions of a once-reputable organization that has destroyed its own credibility by repeatedly applying a double standard to Israel. Apparently El Al signed the Shabbos agreement with the Chareidim just in time. It is not being reported (to my knowledge) that this last Thursday an engine blew out on an El Al plane as it was landing at Ben Gurion. (Not) reportedly the pilot managed to get the nose up at the last second averting a disaster. Most of the passengers apparently only know that the landing was unexpectedly rough. I will only say that there are definitely people who will tell you that as long as El Al keeps the Shabbos, the Shabbos will keep El Al. (Please note: I cannot confirm the facts or details of this story, but I believe my source to be reliable). I received a strange email from someone from Germany of all places. He decided that after reading my blog that I was against “Peace”. I came across Your blog lately. Whatever Your intentions writing this blog may be, one thing is clear: Peace is not included. My definition of Peace is the continued existence of the Jewish people despite the best efforts of those people(s) who are trying or have tried to commit genocide against my people. If you believe that supporting philosophies, ideologies, or policies that cause harm to the Jewish people is "Peace", then no, my definition of peace is not yours, and I'll stick with mine. It really comes down to that, doesn’t it? What is “Peace”? Think about for a minute. I disagree with everything the Left have done to achieve their definition of “Peace”, but can anyone in their right mind say that Israel simply hasn’t tried every possible Leftist maneuver for “Peace” with nothing but increased terrorism as the only return for our attempts? We destroyed our own towns, we’ve given weapons to terrorist "Peace Partners", they have their own elected government of terrorists, we’ve given them tons of money, etc. If something doesn’t work then something is completely off, be it your method, your goals, your definitions, your partners, etc. Clearly it takes two sides to make peace, and for the past dozen years since Oslo only one side has made the attempt, while the other side (well we all know what and I don’t need to reiterate the known and obvious except apparently to people in Germany). As I always say, perhaps it’s time for a correct definition and a new answer. My definition of Peace means that we are not being attacked. My definition of Peace means I can live in my homeland (the Land of Israel) without threat of terrorism, expulsion, or boycott. My definition is that the Jewish state is allowed and encouraged to thrive and flourish in our ancestral homeland. My definition of Peace means that my neighbors either respect my rights or pay the price when they don’t. Certainly I would call this a very minimalistic and basic definition, but if my neighbors can’t meet them, then we have the opposite of Peace (do I need to spell out that word for you?). No, but my definition of Peace doesn’t involve voluntarily walking ourselves back into gas chambers. What’s a little corruption between friends? To be honest, I haven’t been following the news lately. I’ve been busy, and it’s not too often I hear anything that surprises me anymore. I don’t know the details, and you can read it for yourselves in all the newspapers, but it appears that tens of people from the top down in the Israeli Tax Authority (and connected to various members of Knesset and the government) have been giving and taking bribes for tax breaks and the like. That’s not surprising though. We all know it happens, just like we all know Olmert is as corrupt as the Sharon family. What is surprising is that some of the big guys are actually being arrested and being taken down. Of course, things like that don’t just happen without a reason. Obviously someone decided that someone else needed to be hurt or taught a lesson, or to cause or prevent some sort of political fall out. I couldn’t even begin to guess, but with so many important and connected people being taken down, I bet they regret not inviting whoever it is to the Thursday night poker game with all the rest of the boys. Today as I was driving down the street in Jerusalem near Emek Refaim I saw a cop car suddenly pull over and stop a man in the street. At first I couldn’t figure out why. I watched as he pulled out his ID, and at that point they had him open his jacket and they started searching him, even having him remove his belt. After a few seconds I realized that they had identified him as an Arab, though I personally would never had thought he was anything but a Sephardi Israeli. How they knew? I have no idea. I’m sure the liberals reading this are screaming to themselves “Civil/Human Rights Violation” and “Racism”, and planning to write me nasty comments which I’ll just erase. All I can say is too bad. Thank G/d the police do these spot checks and “human rights violations”. Around a month or so ago (I’m looking for the link), in a completely random spot check on Ben-Yehuda St. in Jerusalem, the police surprised and caught an Arab suicide bomber ready to blow himself up. The police went over for a spot check and the Arab boy lost his chance to pull the trigger and blow up all the tourists and Jewish restaurant goers he had planned to murder. I remember that after the Arab terrorists blew up the WTC there were advertisements all over the internet and newspapers for people to write papers on the balance between civil rights and security and how things were going to develop and evolve in the US, and how they should develop. It’s a question every society faces. The US copped out and now we can’t bring bottles of water onto airplanes, equally annoying everyone and providing security to no one. In Israel, profiling is acceptable. Yes, it may humiliate the sector that is profiled, but since that is the sector that all the suicide bombers are coming out from, Israel has decided that they can afford to suffer a little humiliation if it means (and has been proven over and over) saving many lives. So yes, I wouldn’t want to be the one getting randomly searched, though because of Arab terrorism that is exactly what happens to me every time I board an airplane or enter a government office, it has become a necessary tool that has saved the lives of countless people in Israel. Jameel just told me about the Bart family from Gush Katif. Batya Medad has written about it here. The Bart family lived in their Kfar Darom home for 18 years. The wife, Chana Bart was paralyzed in 2002 in an Arab terrorist attack. Their home was just outside of Kfar Darom, and legally purchased with title and deed from the Arab land owners. Their home (wheelchair enabled) was built with all the proper governmental authorizations. Minhelet Sela, under control of Ehud Olmert, has decided not to pay a penny to the Bart family and their 8 children, all of whom were born, raised, and lived in Gush Katif, and were thrown out by the government and their home destroyed when the Jews were expelled. "It's a terrible feeling to see respected and well-educated people sitting on the Disengaement Authority committee, yet they have no heart. They simply treat us coldly and with great hostility... On a personal level, we invested all the money that we had - the money we received for the injuries caused to Chana, and many loans, in order to help our family live." This is abuse, pure and simple. The Disengagement Authority can be faxed at 02 (or +972-2 from abroad) 652-9217. For those who cannot fax, email is second-best: "sela@sela.pmo.gov.il"